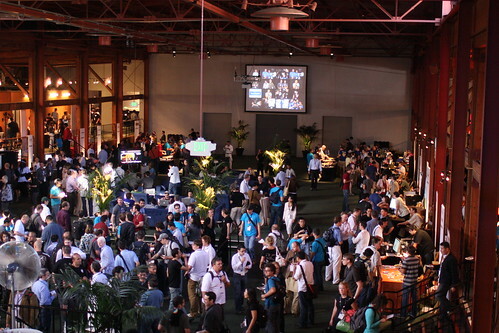 I attended Facebook’s F8 developer conference in SF last week, and met with many of the application developers on the floor, or at their booths. First of all, for those that had booths, it was expected they were demonstrating success within Facebook (who allowed them to showcase). The event itself was a real production, from food, drinks, sessions, panels, the night ended with a private conference from Thievery Corporation, a popular down tempo artist. I also recommend you read my take on what Facebook Connect means for corporate websites. Corporations want to reach communities and customers where they currently exist, and many realize that they are gathering in social networks. Brands have several options, but among them include using widgets (mini-applications) to reach them, there are two main ways: 1) Build their own application (or work with a developer 2) Sponsor, advertise, or latch on to existing successful ones. Focusing on improving applications like Funwall (the top application with an estimated 1.6 million active users), Topfriends and Superpoke. In addition to deploying on Facebook, they are also on MySpace. Slide says they have a strong sales force, and goes direct to brands. Suggests that advertising on slide apps are greater than going with Facebook themselves. Why? Facebook is a utility, when most are interacting with an application. Example: Brands like Estee Lauder has been working with Slide to advertise across superpoke. Example: 10 million vitamin water ‘top friends’ drink on the first eight days. It’s not an ad, it’s an integrated part of the top friends experience. People sent them ‘virtual drinks’. Coke. Adding more applications and helping more developers to monetize. Rockyou is now more like an ad networks, although Slide and RockYou were compared as competitors in previous months, their business models appear to be diverging. They’ve an active sales force that goes to brands to sell ads across their network,. As well as working with agencies. Example: Tropic thunder is an application that used, Superwall, and there was a tab added for top videos that promoted the movie. Viral application developer mainly focused on Facebook (as the name suggests). Have about a dozen employees. Their current clients include apparel companies such as Adidas and consumer companies such as Pedigree and other Fortune 500 brands. Partnered on projects with RockYou, such as Supewall and Likeness. Price point for deals, Minimum for 30-50k range. They do guarantee the app is up and running, do not guarantee visitor numbers. This application let’s users review products of six major types: books, music, movies, restaurants, video games, beers. They’ve recently received 5 million in A round funding. Planning to monetize through advertising and affiliate marketing. Example: Recently did a campaign with Sony, and promoted a movie (that was an book adaptation) they then used cross-movie promotion on books by that author. Example: A brand that has interesting content on their site (that is frequetnyly update) can quickly and easily use iWidgets to reach the newsfeeds on MySpace, Facebook, iGoogle and Netvibes. Coming soon is Bebo and Hi5. Wants to reach brand, media, companies. Can help increase exposure of brands on social networking platforms, motto: “Apps are the Microsites of Social Network”. Claim to fame: a Social Marketing Company. They aim to build ads, build widgets, and advise.. these are really ‘interactive ads’. Current client base includes EA, Spore, Bank of America. Example: Microsoft office did a campaign called ‘office poke’ that sent Microsoft branded pokes to each other with business humor. There were millions of pokes were sent. 700.000 installs and continues. Even though the campaign is over the application is downloaded and spread –over successful. While not a Faecbook developer, I was able to spend time with the founders, as an outlook plugin, that makes outlook a socially aware utility. Recently, they announced a partnership with Linkedin so their social graph is displayed on Xobni, an outlook application. How they can make money? They are evaluating the different ways to monetize such as premium models. It’s really great meeting folks at startups, you can often see the fire in their eyes, hear the passion in their voice as they share their dreams. On the flip side, it’s also very hard when you see that they’ve commodity technology, are entering an already crowded market, or have rough marketing skills. I can see the pattern of companies that come and go, after attending so many STIRR events, startup events, and seeing the many early (seed) startups at the Techcrunch party two nights ago. Mark declared in his keynote that providng a safe and successful experience for users is key, as a result, they are creating methods to filter applications that provide respectful user experiences that are non-invasive and protect users’ identiy first. Others will be penalized. Expect developers to clean up their act. Applications/Widgets are very complicated story to tell to corporations, many corporate folks don’t “get it” and would rather rely on tried and true forms of web marketing like microsites or traditional advertising. More than one widget vendor told me they are having a hard time explaining their story to brands. There’s a lot of truth with this as when I give presentations to Forrester clients about social computing, I often have to explain what a widget is. Unless you’re directly in the space it’s very difficult to keep track of who’s doing what, with low barriers to entry (400,000 developers currently exist) there are many entrants. As a result, this petri dish is constantly flexing and remorphing, business models, revenues streams continue to change. In Mark’s keynote, he said there was $200 million total of funding to developers from a variety of investors. This large influx of capital is allowing for many startups that may not have had the chance to launch products. A year from now, it will be interesting to see a string of dead applications that were once funded –but not adopted by users. While Facebook was the first to offer an open platform for developers, there’s been many containers that have opened up, as such, developers are seeking to widen their network by expanding to new communities.